There&apos;s nothing like this one in CHAMPION STATION & PLAINVIEW SCHOOLS Total Custom Remodeled Townhome on Corner Lot with approximately 2547 sq. 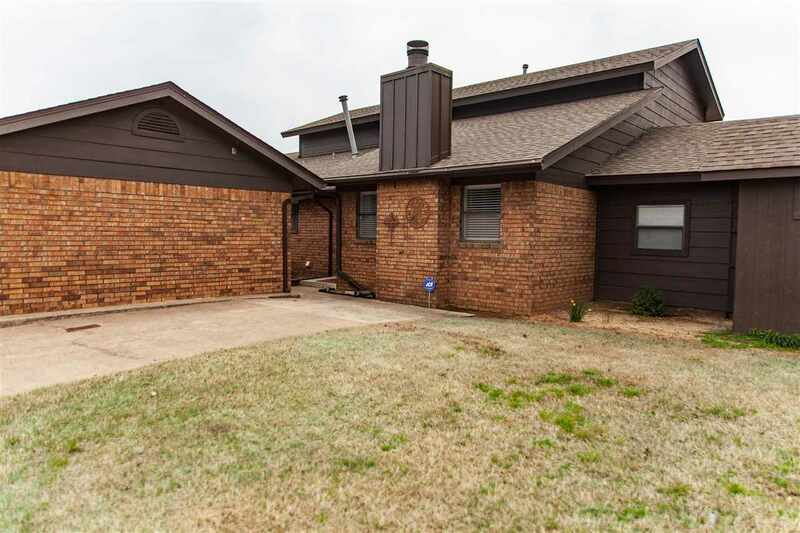 ft. 3 Bedrooms/2.5 Baths & Turn-Key Ready. Just to mention a few of these UPGRADES beginning with a beautiful Remodeled Kitchen with Travertine Counters and Beautiful Upgraded White Cabinets, NEW Upgraded Carpet and Extra soft pad, NEW Large Deck in your very own back Private Fenced yard. NEW Alarm System, NEW CH&A, (the Second CH&A was installed 2017) New Furnace. Roof is 4 Years Old. One of the only Townhomes in the neighborhood that comes with your very own 8" thick cement wall Storm Cellar. This unit has a Mother in Law Plan bedroom En-suite again with more custom built in cabinets, Large walk-in closets and tiled shower. 2 Car Carport, Storage Units. Don&apos;t worry about mowing the Monthly fees $90.00 will include all your lawn-trimming work while you enjoy the tennis courts, club house, swimming pools just in time for Oklahoma Summer and ready for the whole family!